As we draw closer to the release of my next book, Project Fire, I’m honored to share with you a sneak peek of its content. This is no ordinary preview chapter, however, as it is an exclusive piece of content that we retrieved from the cutting room floor to share with our blog readers. Think of this as an encyclopedia of grills from Planet Barbecue, and a reference point for you to use as inspiration in your grilling journey. When you come across these grills, be sure to share with me on Facebook, Twitter and the Board. Asado al disco: A Chilean grill formed from the disks of a harrow. OK, cooking on it is more like stir-frying than grilling, but don’t tell that to a local. Caja China: The “Chinese box” looks like a steamer trunk. Yes, it burns charcoal, but you put the coals on top of this collapsible metal box; the pig cooks inside. Fogo de chao: “Campfire,” literally—Brazil’s answer to Argentina’s asado and Colombia’s hogao—all three consisting of a bonfire surrounded by large chunks of meat roasting on vertical stakes. Fogolar: A freestanding raised stone hearth (often on table legs) used as an indoor grill in northeastern Italy. Infrared grill: For people who crave a steakhouse-quality char on meats grilled at home. That is to say, a gas grill with propane-heated ceramic honeycomb burners, which enables you to attain temperatures of up to 1000 degrees F using commonplace propane. Kamado grill: A large, egg-shaped ceramic grill and smoker distinguished by thick ceramic walls (the better to retain heat and moisture) and highly efficient venting. The Big Green Egg is the best-known example. Kettle grill: One of the world’s best-selling charcoal grills, with bowl-shaped firebox and a domed metal lid. Mangal: The best-known grill you’ve likely never heard of. On any given day, more people are cooking on this grateless, trough-shaped, charcoal-filled, rectangular metal or stone box than probably any other type of grill on Planet Barbecue. Parilla: The design of this South American grill varies from region to region, but most include a cesta, a U-shaped metal basket, where logs are burned to embers, and the parilla itself, a grate comprised of downwardly sloping metal bars, whose V-shaped grooves channel the fat off the fire into a drip pan. Schwenkbraten: Germany’s “swinging” grill, with a grate hung from chains or a tripod over the fire. You swing or spin this grate over the fire, which evens out the hot spots and cool spots. Steel drum grill: The grill of choice in the Caribbean: a 55-gallon steel drum cut in half, mounted on legs, and fitted with a grill grate. Some models have lids and chimneys, so you can use them for smoking. Sutbul-gui wharo: A Korean grill remarkable for its high performance and small dimensions—imagine a heavy earthenware flowerpot filled with embers—small enough to fit on the center of your table, but powerful enough to grill a whole meal. Tandoor: India’s vertical, urn-shaped barbecue pit. Born in northern India (or in Pakistan, Iran, or Iraq) more than 5000 years ago, it’s one of the oldest grills on Planet Barbecue, and one of the most ubiquitous—with versions turning up in places as far flung as Morocco, Turkey, and Uzbekistan. Tuscan grill: This fireplace grill is simplicity itself, consisting of a steel or cast iron gridiron on legs. You position it the fireplace, raking wood embers under it when you’re ready to grill. 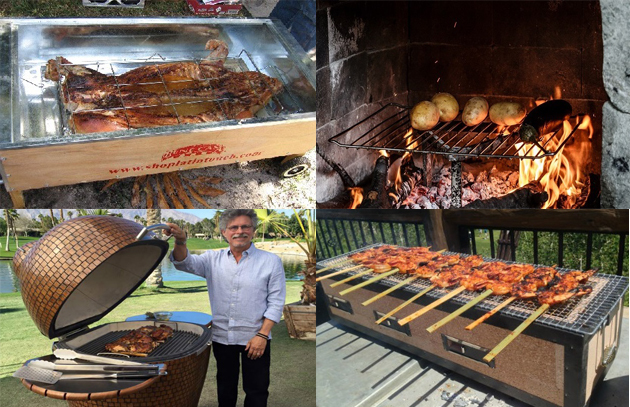 A modern approach to grilling from Steven Raichlen, America’s “master griller” (Esquire). 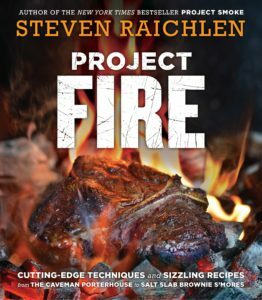 With 100 recipes, Project Fire shows how to put the latest grilling methods to work—from spit-roasting to salt-grilling—using favorite ingredients and adding a dash of daring in flavors, technique, and presentation.